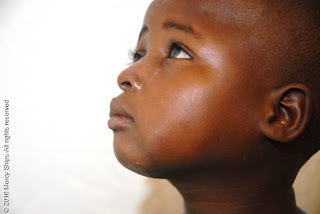 Aissa lives in the north of Cameroon, West Africa. Abandoned by both her mother and father, she was living with her grandma when she got sick. 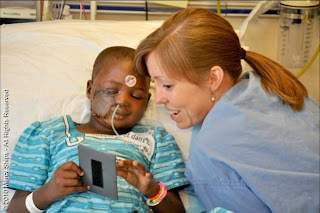 Her family brought her to the Meskine hospital, run by the Medical Centers of West Africa. She was found sitting outside the hospital pharmacy, skeletal, her face covered with a dirty rag, surrounded by a swarm of flies. At 6 years old, she weighed 10 kilos. She was dangerously anemic, and could no longer walk or eat. She was diagnosed with NOMA , which is fatal in 90% of cases. She was hospitalized, but the family wasn’t able to pay for her care. They planned to take her home after just four days. Had they returned home, she would have surely died. 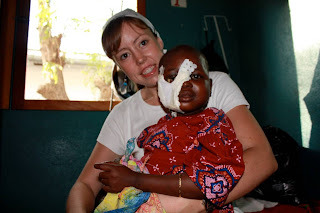 The Medical Centers of West Africa chose to cover the cost of her care. Slowly she came around. One day she smiled. Then she began to walk and play. 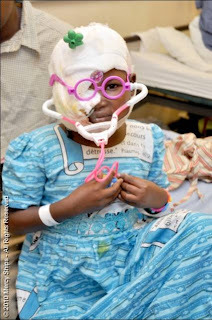 Her photos were sent to Mercy Ships, who invited Aissa to come for a life changing surgery. A surgery that would bring her healing, restore her spirit and give glory to God. The organization Willing and Abel paid for Aissa’s travel. So this baby girl, who almost died in obscurity just one year previous, got on a plane and flew to Togo. And our God, who is able to do immeasurably more than all we ask or imagine, placed her in the care of a team of specialists who gave her back her face. Hallelujah. Written by Sarah Root. Sarah is a physician assistant at Meskine Hospital. She travelled to the ship with Aissa and has been acting as her caregiver and translator.